So you’re looking for ideas to spruce up your backyard and garden? 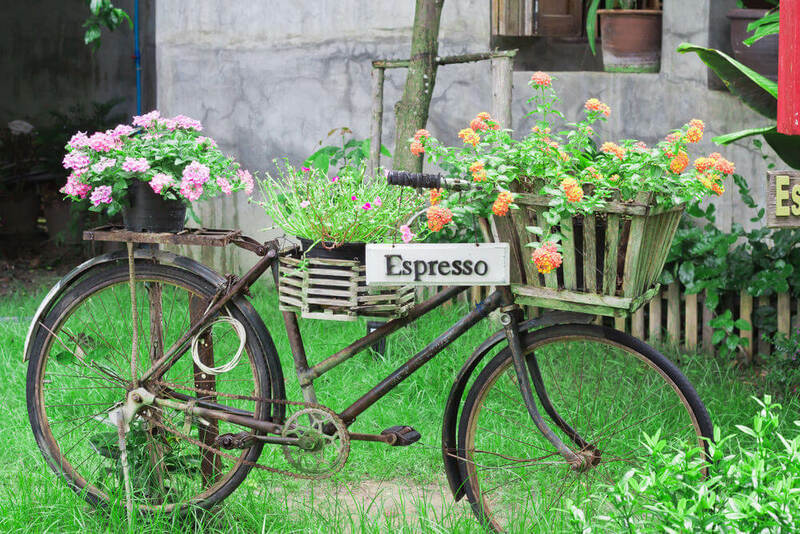 There’s no shortage of fun and creative garden ideas. 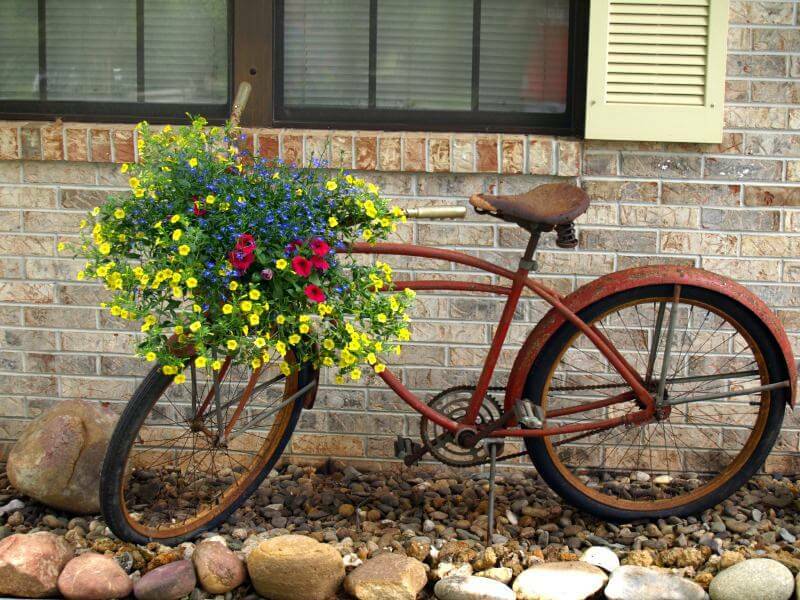 One option you have is to turn an old bicycle into a flower planter. Doing this creates a sculpture for your garden that’s flowery, colorful and unique. Besides, what else will you do with your used penny farthing bicycle? 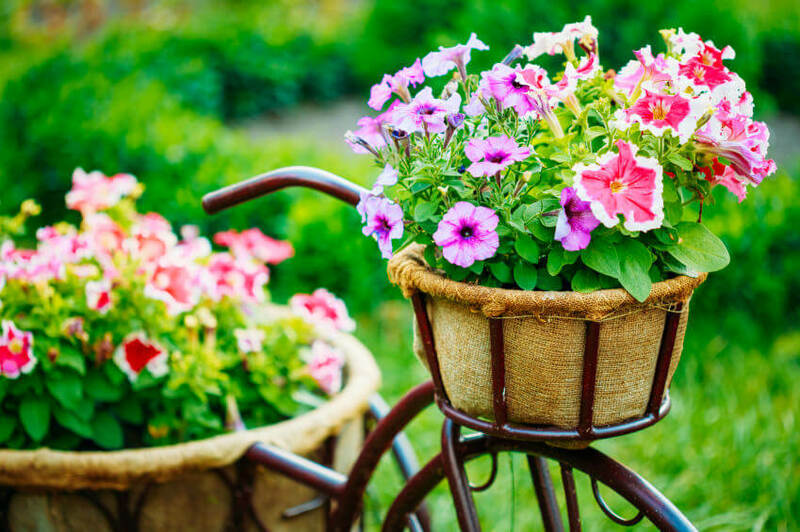 Instead of just one bicycle flower planter in your yard, create garden with several of all types of bicycles. It could be a small sea of bicycle planters which I think would look great. 1. Paint the bicycle(s). I really like the white bike look with flowers all over it. 2. 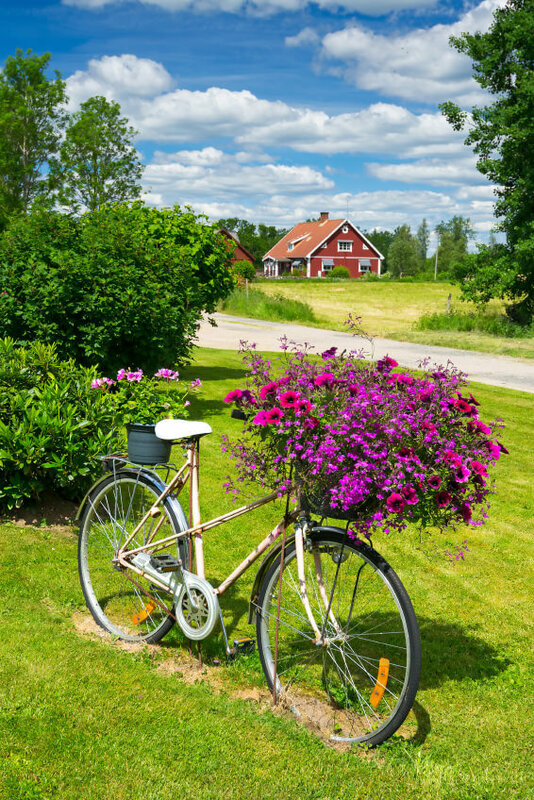 Use several bicycles to create a dynamic bicycle garden. 3. Use antique bicycles: Antiques are fun and stylish. 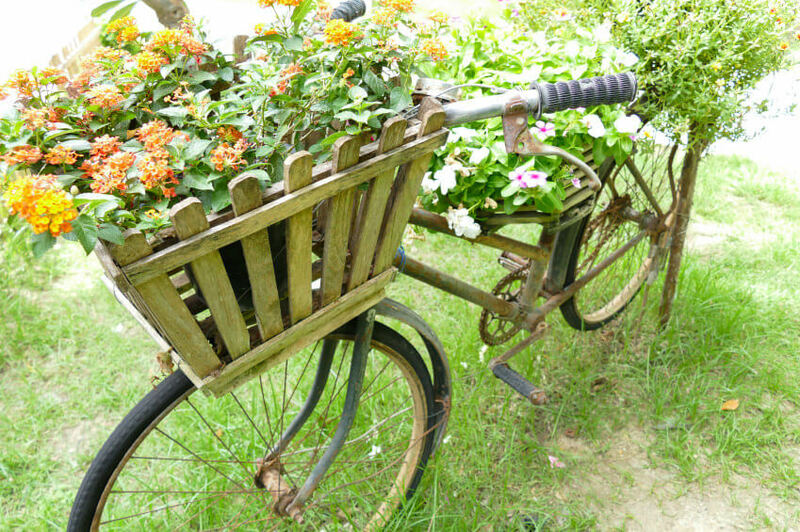 If you’re into antiquing surely you can find some older bicycles that would make for a great planter. 4. Other ideas: Check out our gallery below. 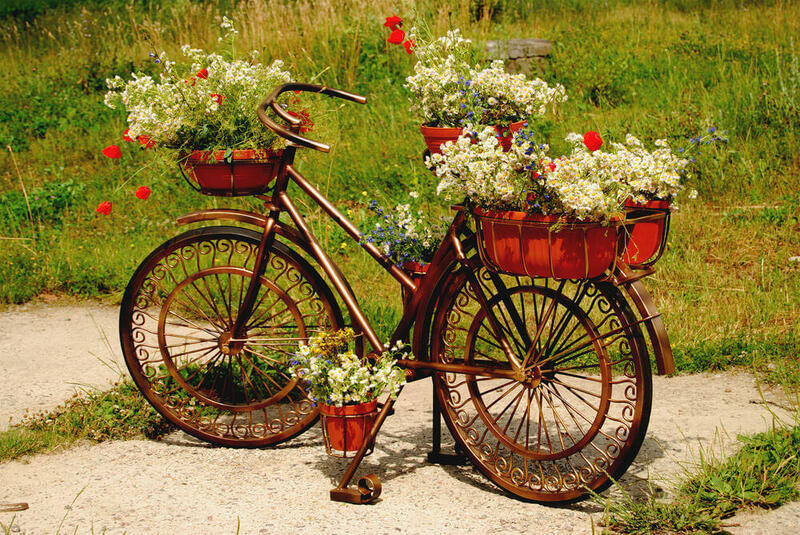 Some people prove to be highly creative with bicycles in their garden and/or serving as stand-alone planters. 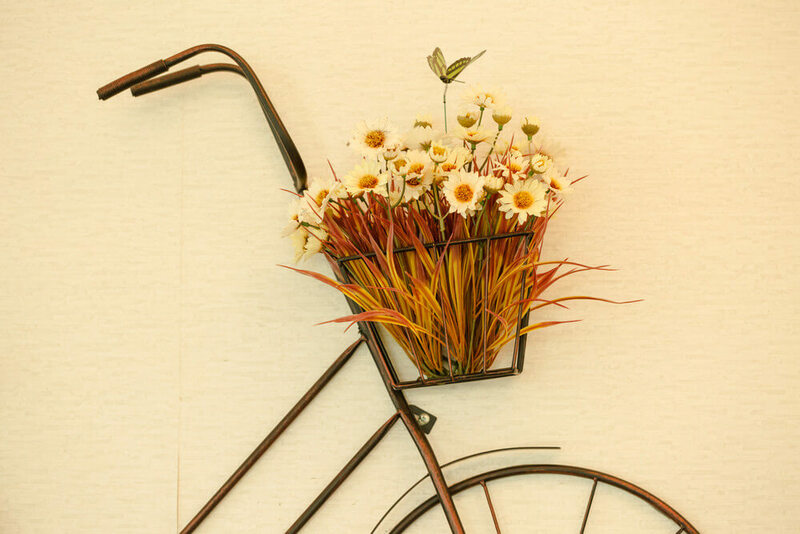 Here’s a penny farthing bicycle flower planter. It’s a great addition to any garden. I like how it’s painted white. 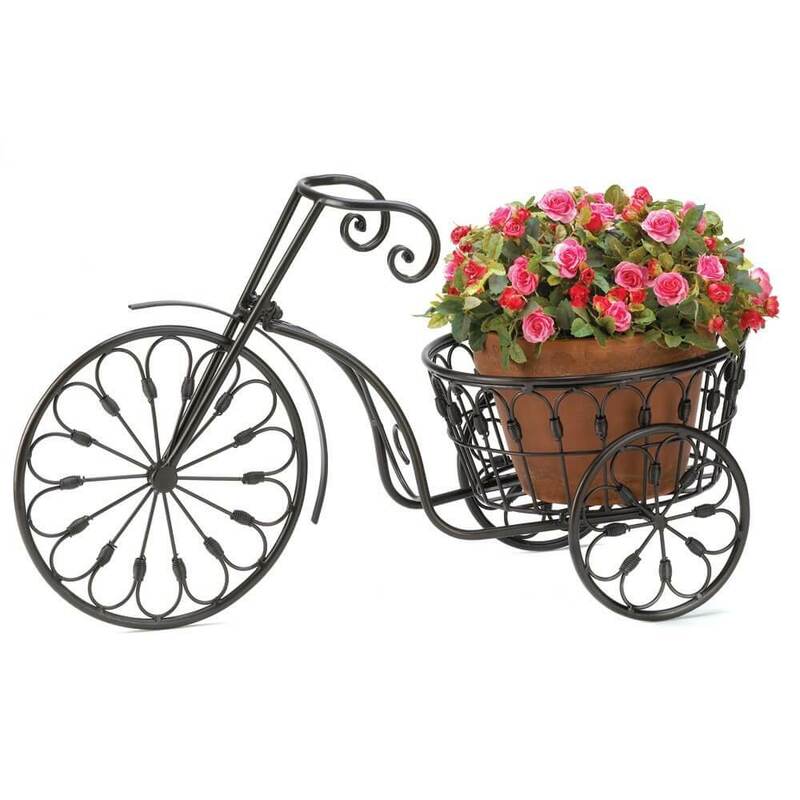 This is a pink bicycle flower planter. It’s a more contemporary bike design. Again, the paint job, while pink isn’t my first choice, does give a more “sculpture” appearance. 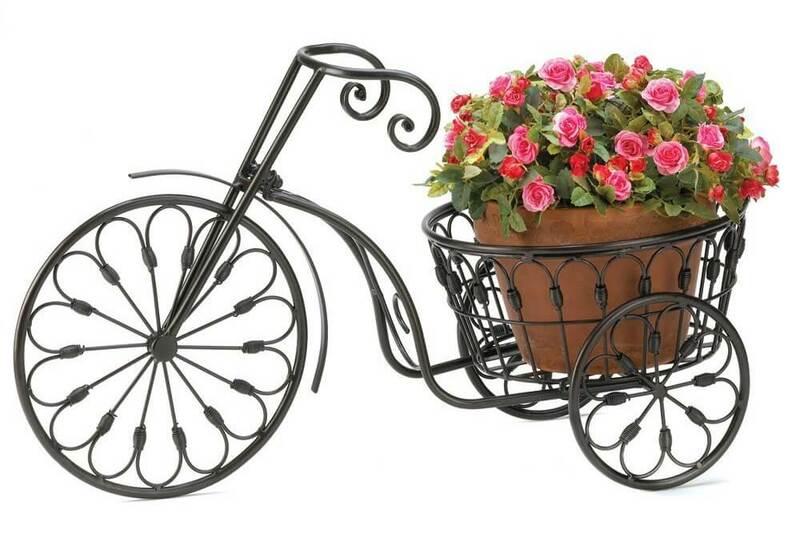 Here’s a rust-bucket of a bike turned flower planter with wicker basket planters on the front and rear. 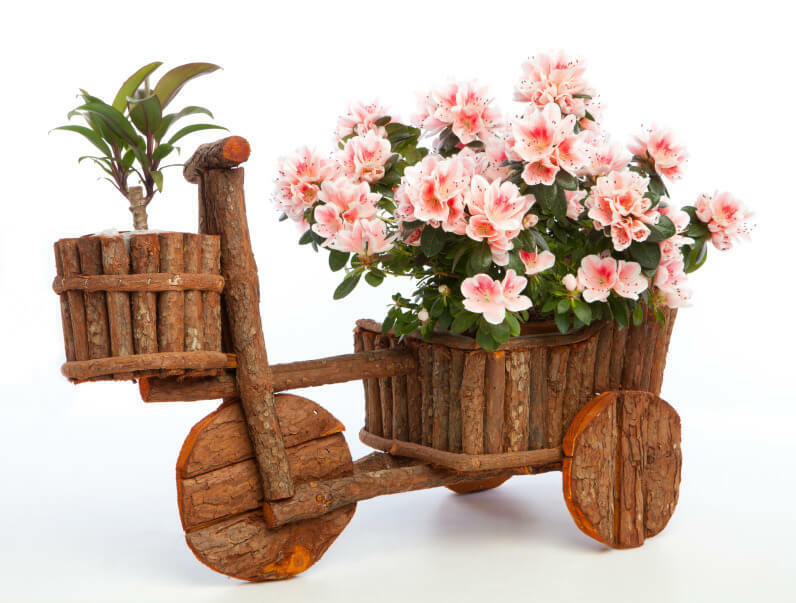 Here’s rustic bicycle model planter made with wood branches and bark. You could easily replicate this on your own. It’s too bad the image above doesn’t showcase it in a garden in which I think it would look fantastic. 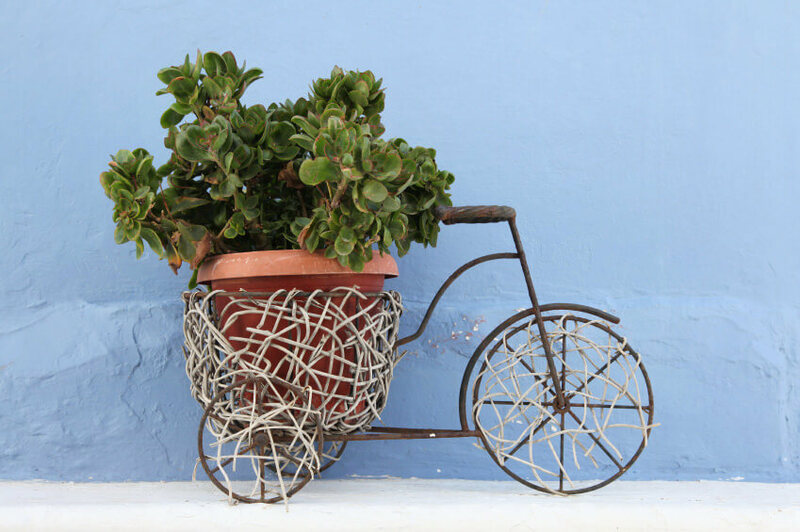 Here’s a decorative white bicycle planter. I think this looks fantastic being all white with 2 designated planter locations in the front and rear. The flower power bicycle. It’s a modern-day mountain bike done up with flowers. It’s a little kooky, but it gives you an idea about how wild you can get with flowering up a bike. Another purely decorative tricycle turned planter that’s able to accommodate a large, heavy planter in the rear. This is a great idea because it focuses on the plant and less on the tricycle. 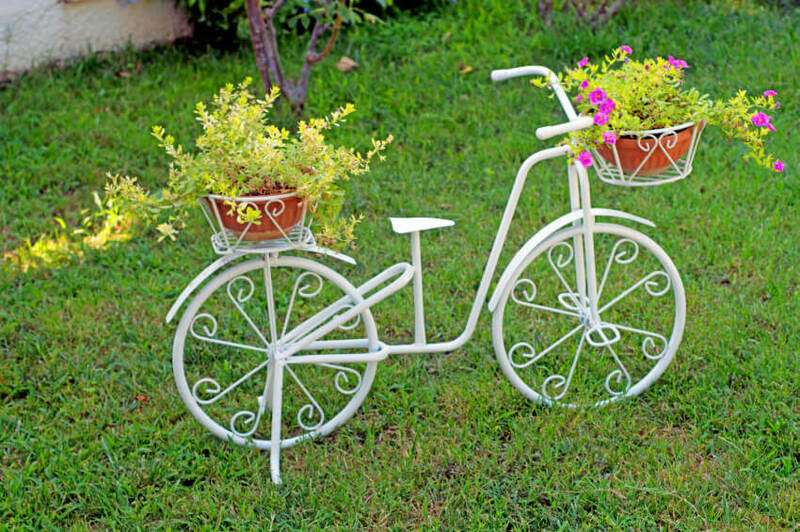 Whimsical white bicycle sculpture with flower pot holders. 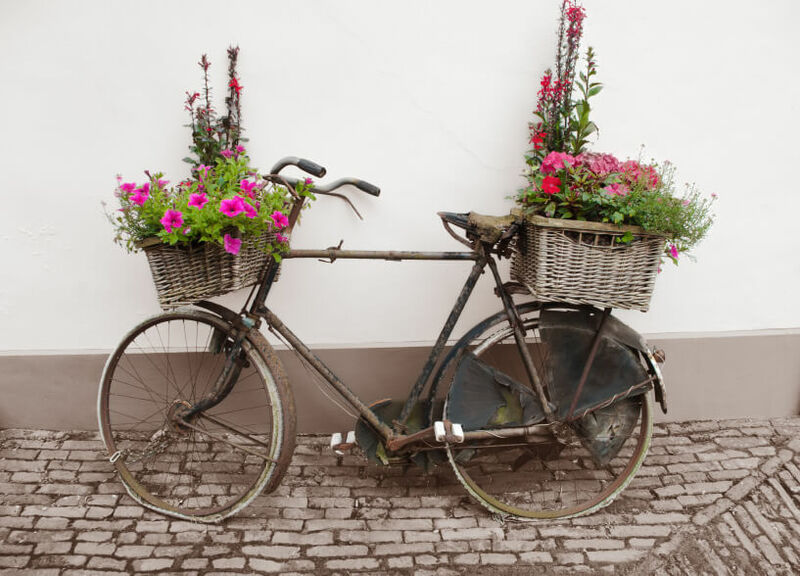 Here’s a great example of a functioning bicycle turned into a planter with a huge flower arrangement on the front. I’d paint it to get rid of the rust but otherwise it’s a perfect bicycle planter. 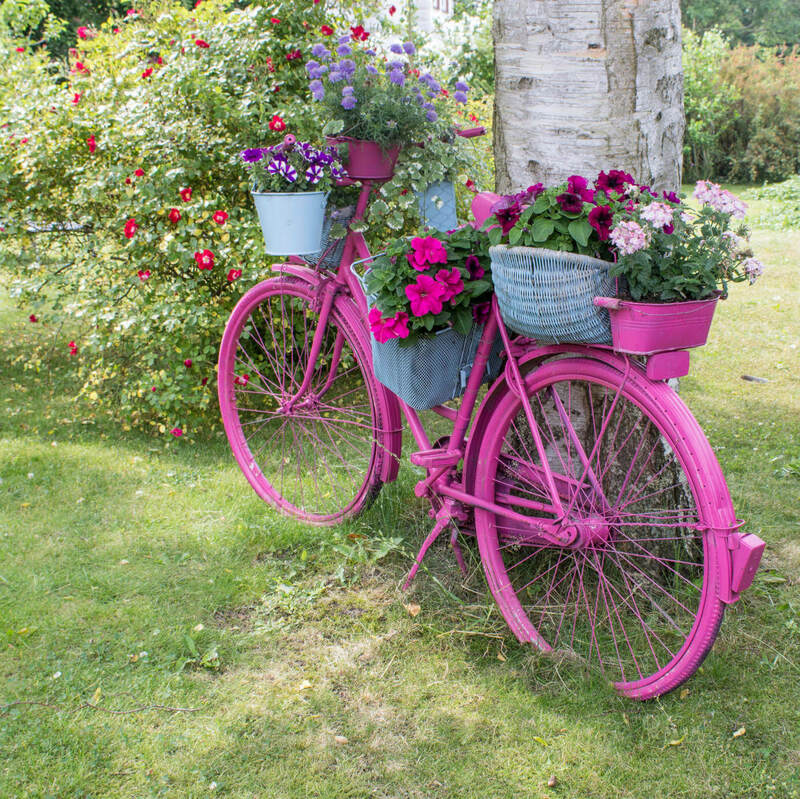 I love this bright pink bicycle that’s a holder for pink flowers. Great coordination and excellent example of how take up this gardening sculpture concept to another level. 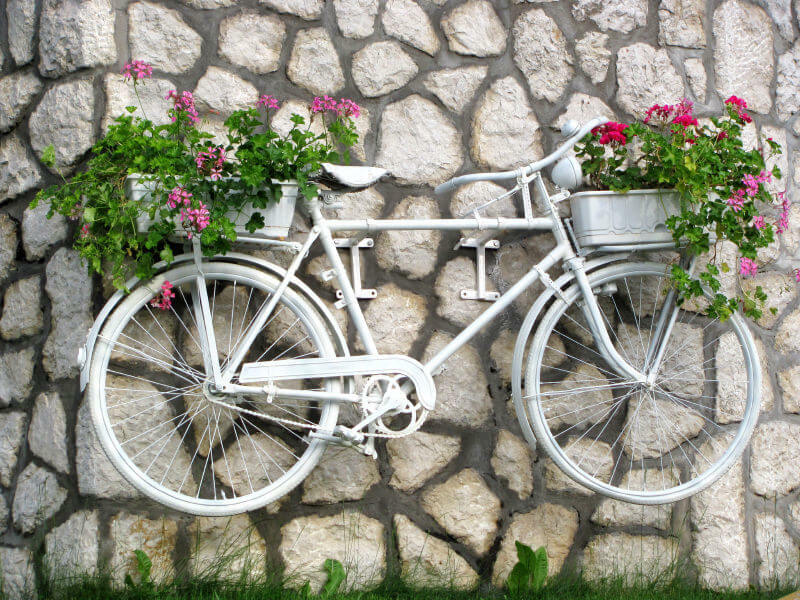 White painted bicycle holding pink flowers on front and rear mounted to a wall. This is kind of cool – the bike is a planter mounted to a wall. Image a fence with a stream of 5 or 6 bicycles like this. That would be very cool. Rusty old bike with bright shimmering yellow, red and blue flowers. The bike needs a little sprucing up but the style is great as a garden structure. Blue bicycle holding flowers mounted to a tree. 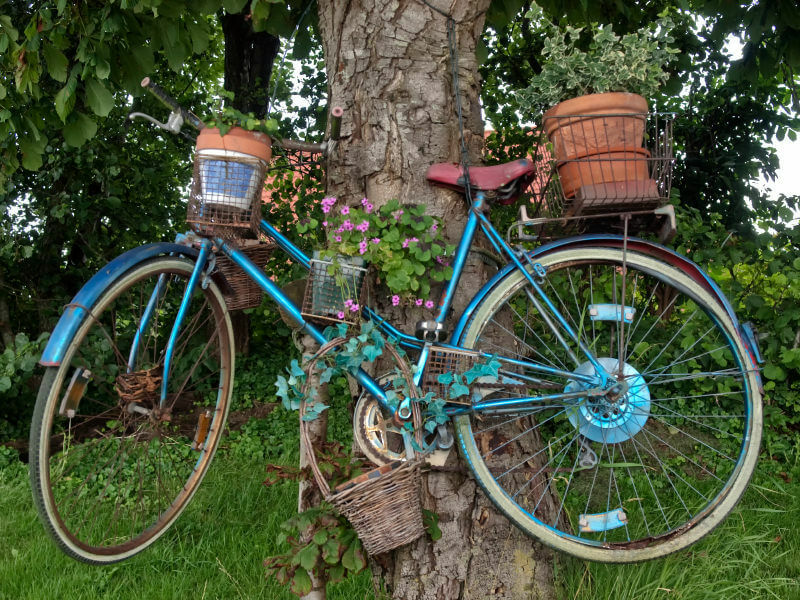 In case you think your backyard trees need some decorating, you can pin a bike to it and add some flowers in hanging baskets. I don’t think this is for everyone, but you just might love the idea. I think this is a bicycle decorated with flowers. 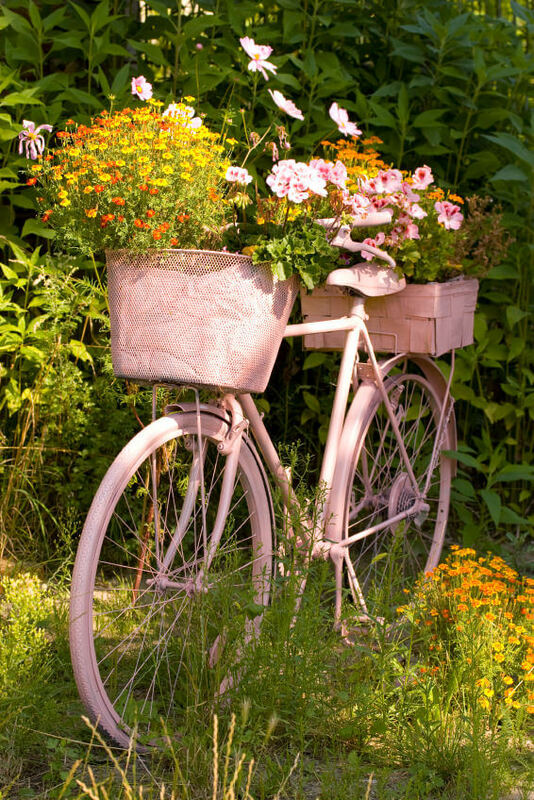 Your bicycle need not be relegated to the garden to serve as a flower planter. 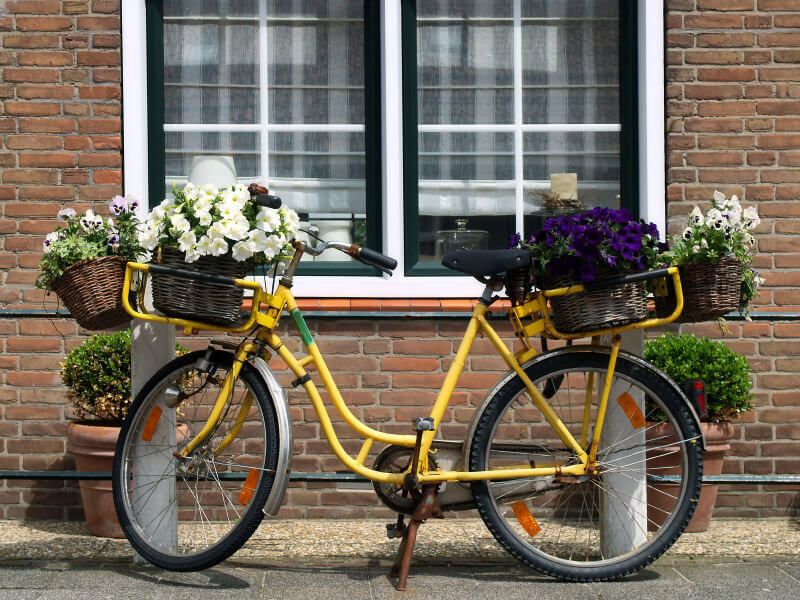 You can cycle around town proudly displaying your flowers in the front and back. Close-up of a flower in a bicycle-shaped sculpture. This is a bicycle sculpture designed to have flower pot holders. 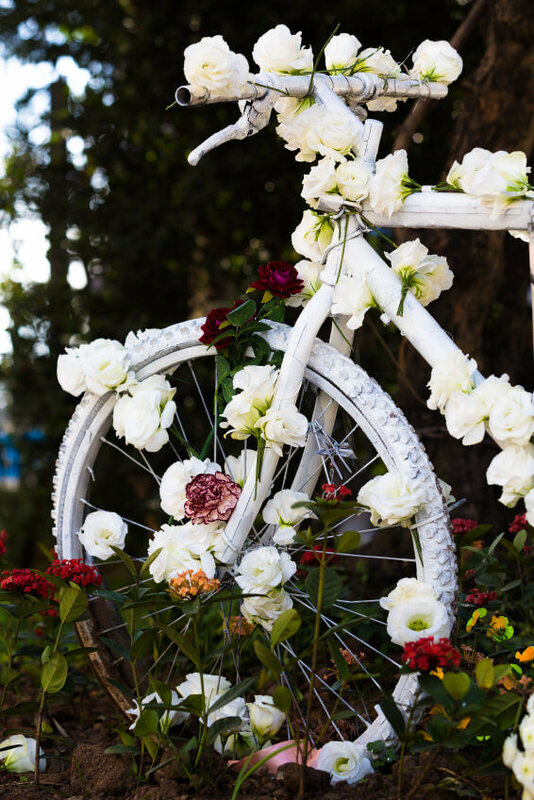 The ultimate wedding bicycle decorated in white flowers. For any cycling enthusiast getting married, here’s an idea to really deck out your wedding area. Splash your bicycle(s) with flowers. Bicycle planter with custom large wood planter on the front. 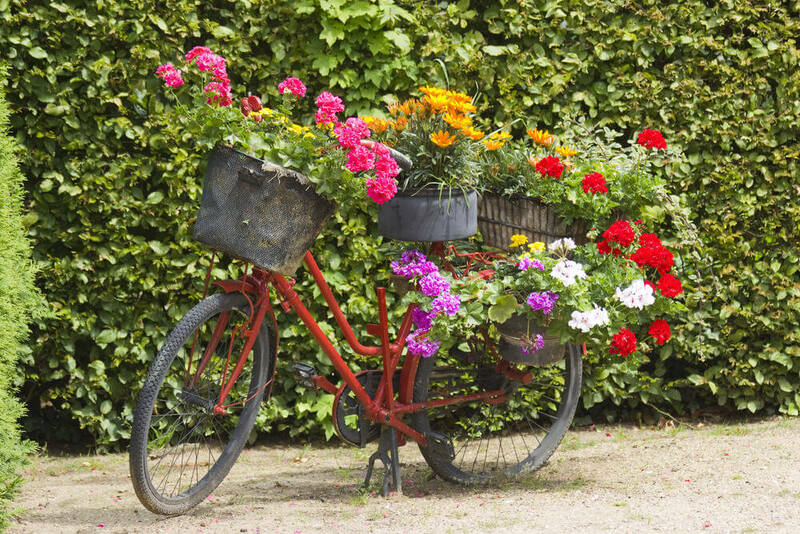 I love it when these garden bicycles have larger planters built onto them because the larger flower/plant arrangements remove focus from the bicycle. 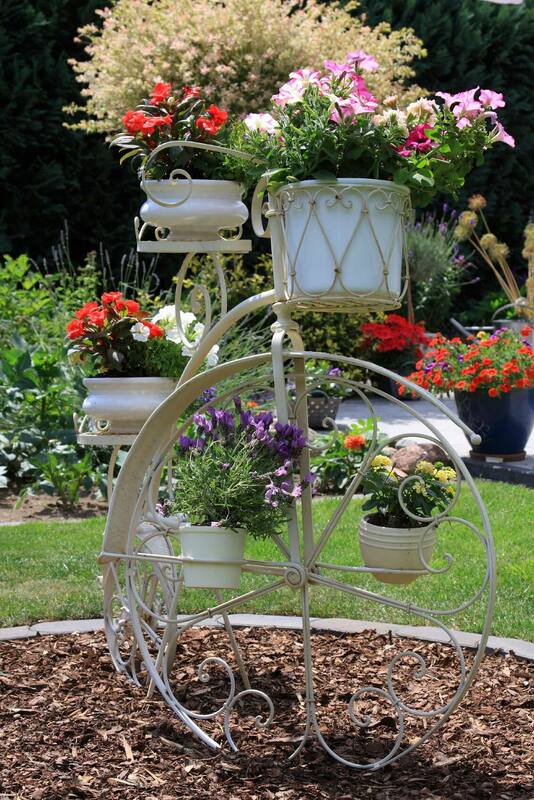 The tricycle flower planter is ideal because you can place larger and heavier arrangements on it which can look fantastic. 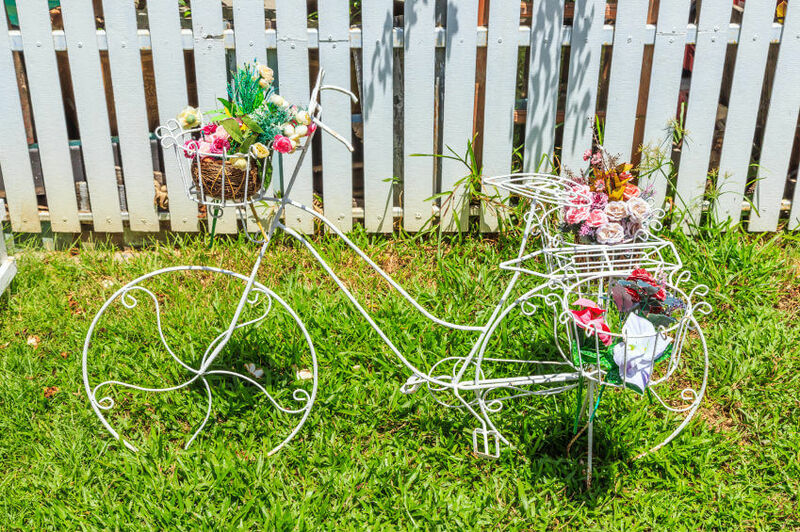 This is a tricycle sculpture holding a large flower arrangement. It definitely works well as a stand-alone sculpture in the field. 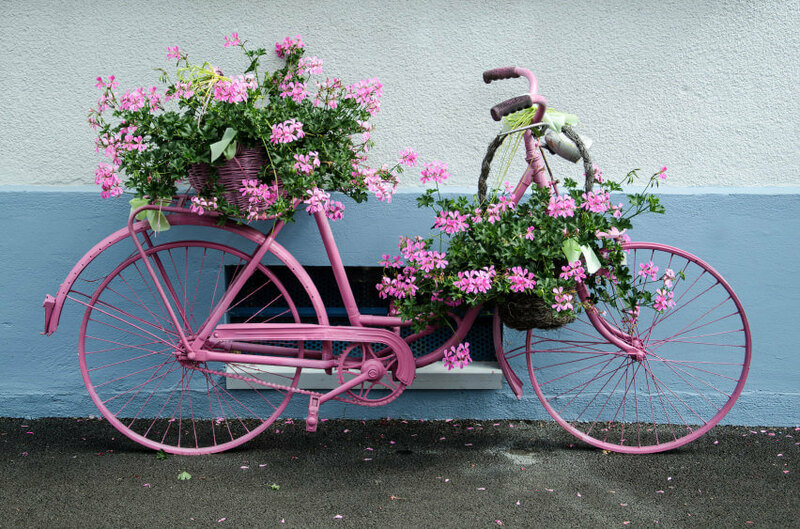 Pink bicycle outfitted with many flower holders. 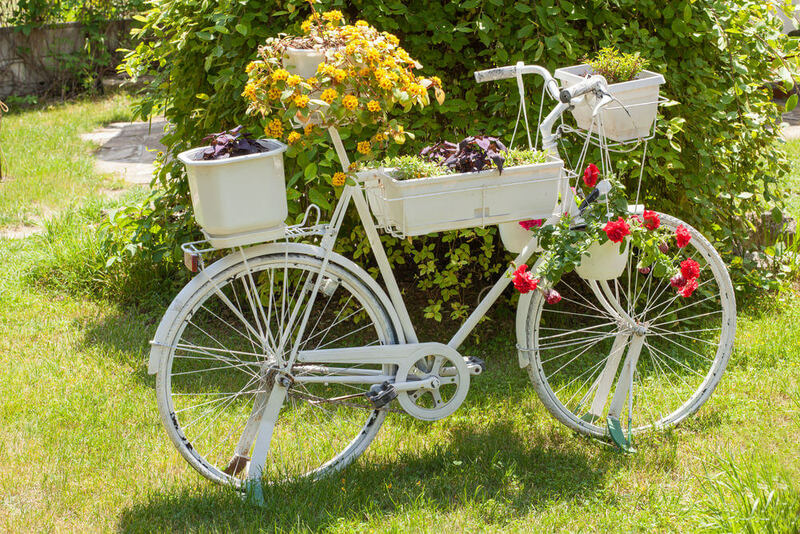 Here’s an example of how to outfit a bicycle with multiple flower holders. 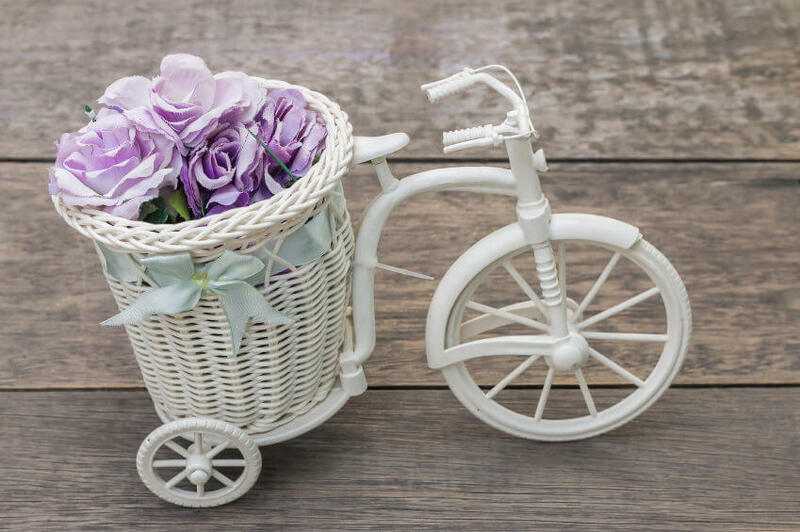 A cute all-white tricycle flower holder. 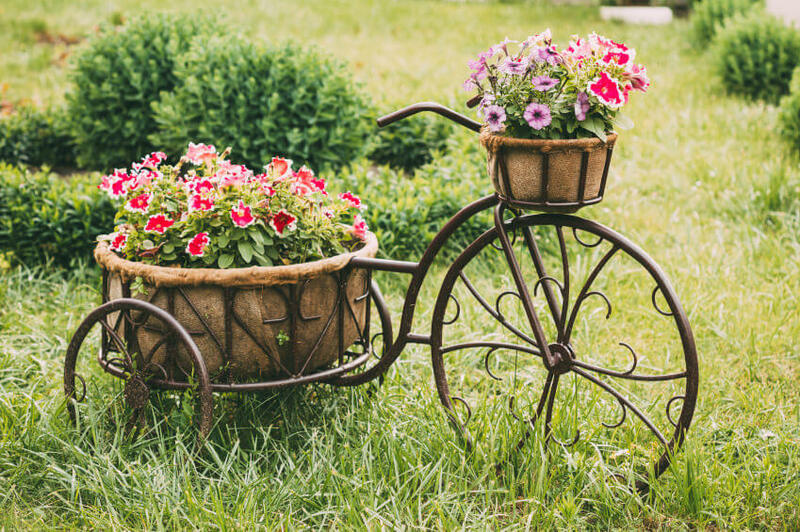 Clearly this was never a functioning tricycle, but it’s a good example of how you can actually buy bicycle and tricycle flower holders (see 2 more you can buy below). Penny farthing and old-style tricycle flower holders. 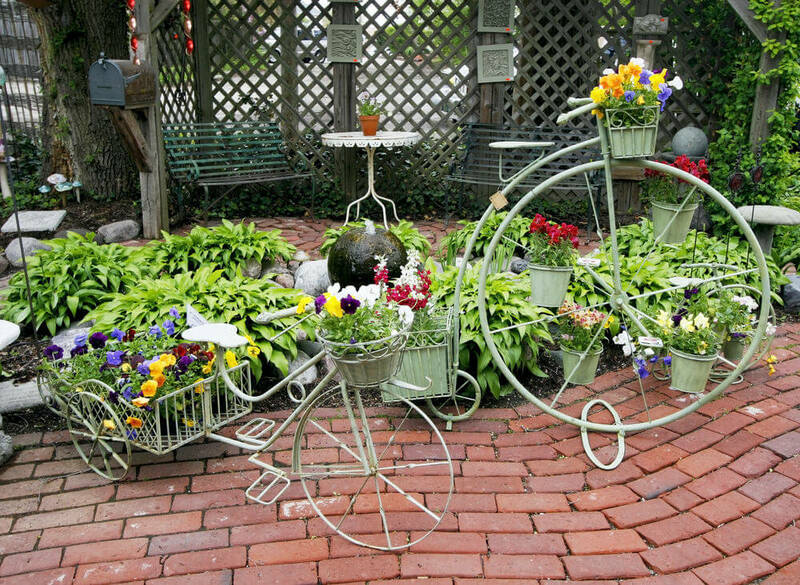 These two bicycle sculptures are a great combination and dress up the patio very nicely. 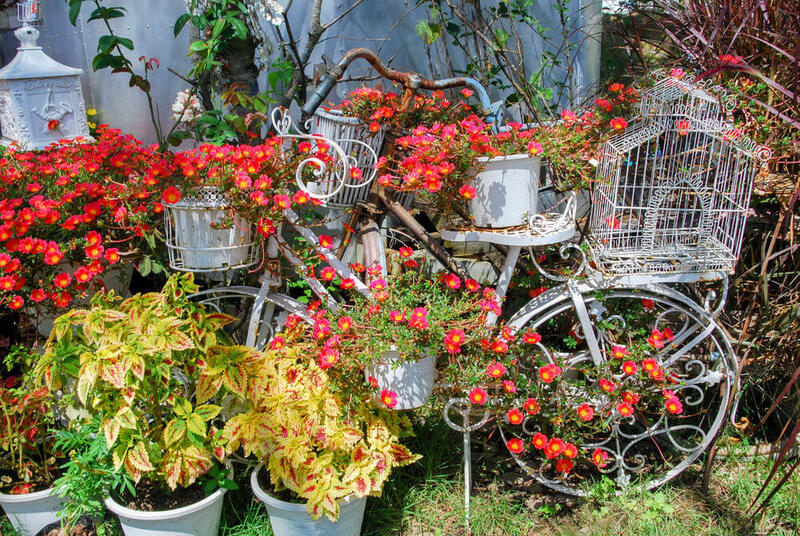 Wild hippy rust and red colored bicycle holding red flower pots with white flowers. I love the cute small flower pot on the petal. That’s a great idea. Red bike loaded with flowers. 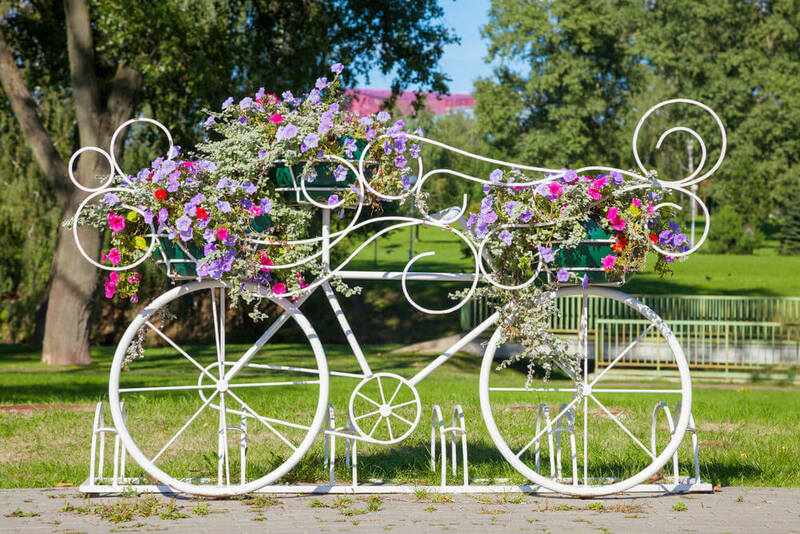 Here’s a great example of loading down your bike sculpture with flowers. I like the burdened look of this. 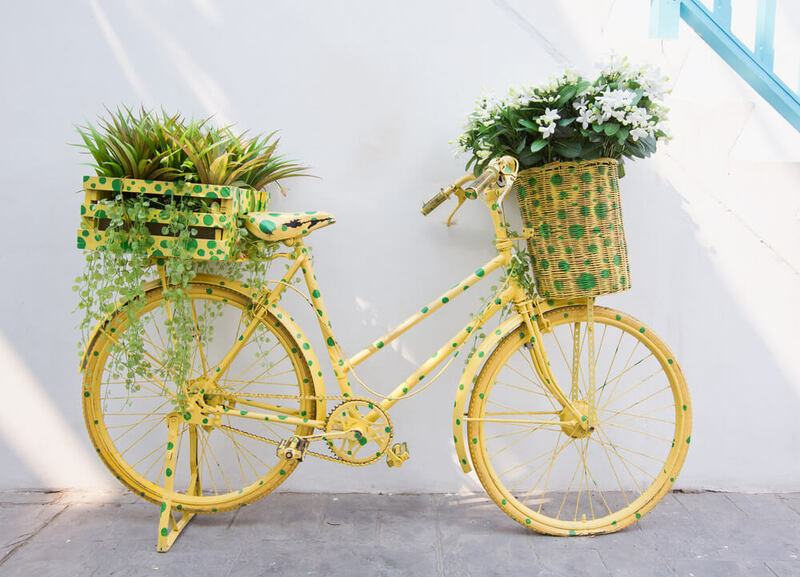 Yellow bike with green polk-a-dots with flower planters (wicker and red) on the front and back. Here’s a great example of having some fun with the painting of the bicycle. Flower bike sculpture attached to a bicycle stand. Great idea for parks and your home if you have kids and a fleet of bicycles. Here’s a flower holder against a wall with a bike outline on the wall. It’s a 3D piece of wall art. You could do this to a fence, shed or if brazen enough, your home’s exterior wall. 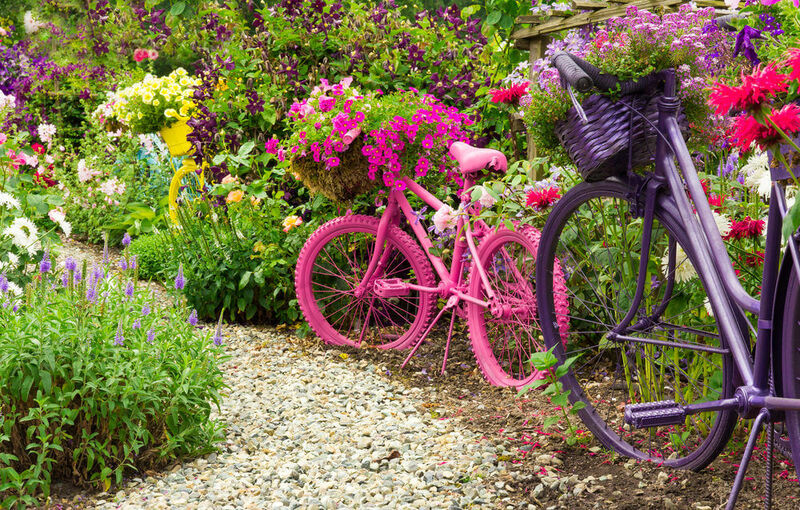 2 bicycles bright pink and purple in a large garden holding flowers. 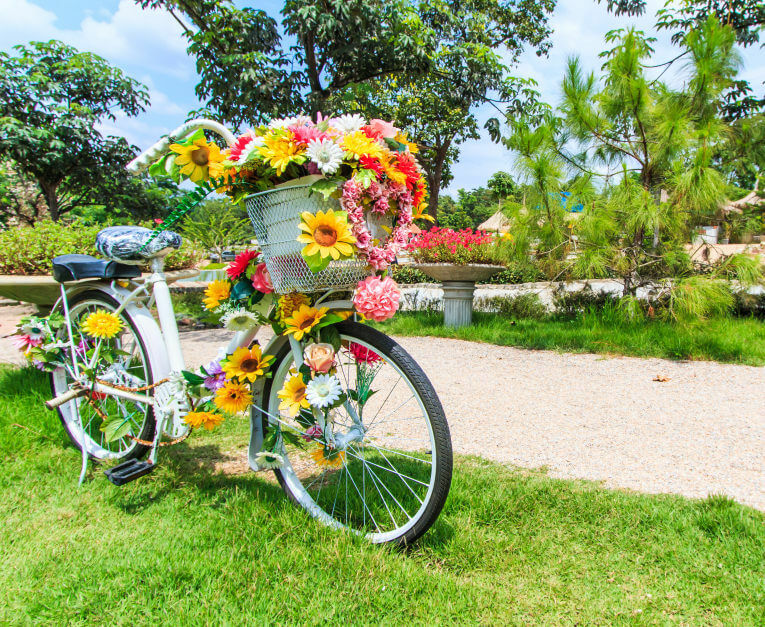 This is cool because it’s a bicycle scene in a garden. 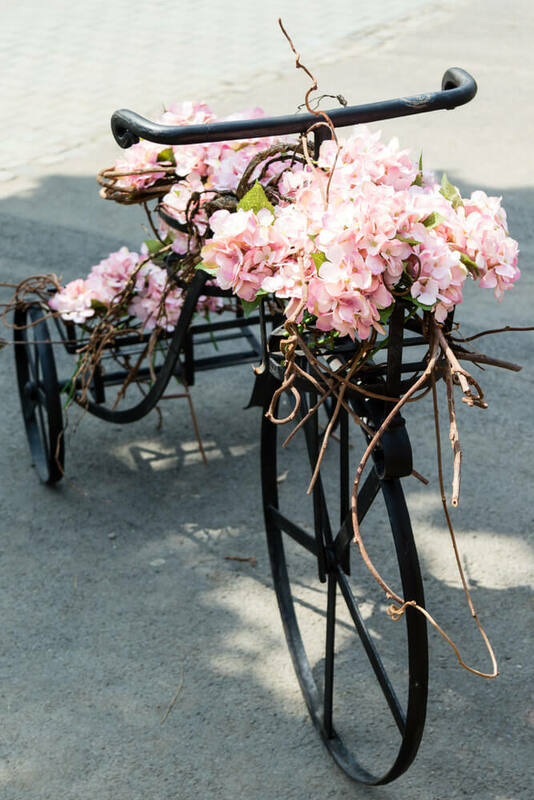 Antique tricycle ladened with beautiful pink flowers. 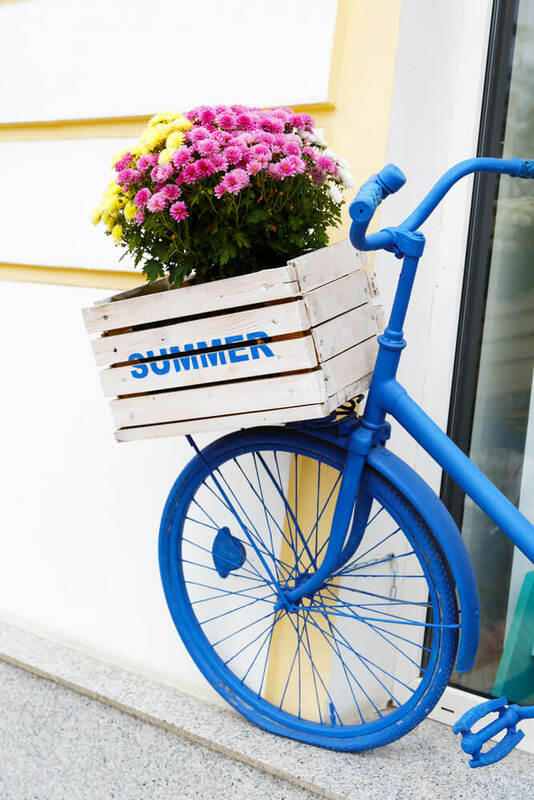 Beach style blue painted bike with white wooden box flower holder on the front. Bicycle flower planter also serving as a sign. It’s a great idea for a sign holder. 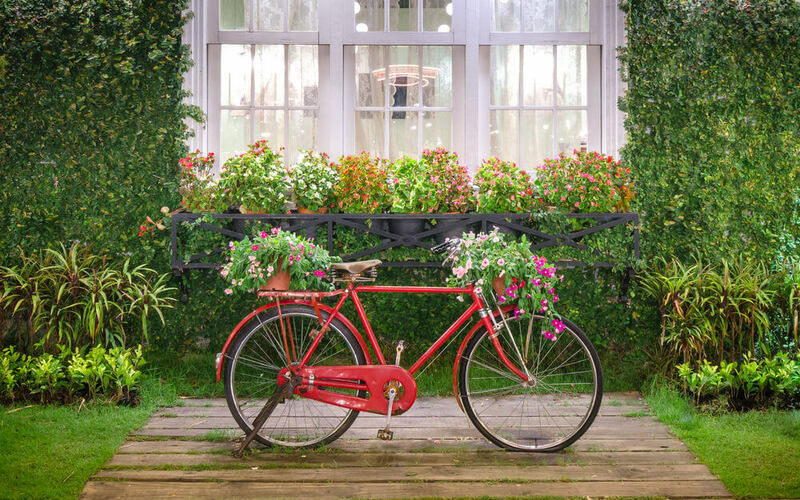 Bright red bicycle with large flower pots on the front and rear in a beautiful garden setting. Bicycle planter overrun with flowers in jumble of potted flowers. Kinda messy cool. 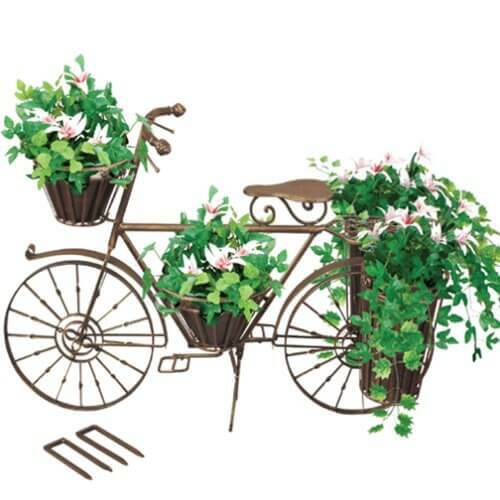 Buy this bicycle planter here.